Best Chess Gift? Chess King 4, Chess King 4 Pro! 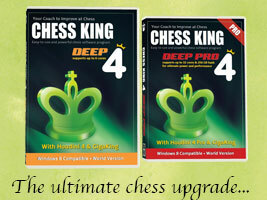 Do you know what’s special about Chess King 4 and Chess King 4 Pro? It’s now the best version of the software which includes the brand new Houdini 4 and Houdini 4 Pro engines. The software is easy to use and more powerful than ever. The “normal” version is graded “deep” and can handle up to 6 processors, and you could build the ultimate chess system with the “Pro” version which supports up to 32 processors and 256 GB of hash. That’s the one 12th Women’s World Chess Champion Chess Queen™ Alexandra Kosteniuk uses because it’s the fastest and she have 8 processors! On the Chess King Training site, you can buy the downloads today and order the DVDs. It’s possibly the best chess present you can make yourself or a loved one. The author of the new Houdini 4 engine, Robert Houdart, describes the new version as a major upgrade with many evaluation and search improvements in all phases of the game, which corresponds to about 50 Elo stronger than its predecessor, The improved strength means that Houdini 4 nearly doubles the chess performance of your PC for game analysis and match play. The tactical mode of Houdini 4 will find more solutions and provide faster solution times in tactical test suites than any other engine. There are now 4 versions of Chess King, at price ranges from $29.95 to $99.95. They are all complete programs which will allow you to play and analyze your games, solve puzzles, study openings and games, etc. All include versions of the engine Houdini and a GigaKing database of at least 5 million games, and a huge opening tree. You can’t go wrong with any version of Chess King, as even Chess King 2 with Houdini 2 is a complete program and still mighty strong. To buy the downloads and get them today click here.